The 2019 Panamera GTS is the best-driving four-door Porsche to date. Navigating GT territory requires a very precise map. Historically, we’ve seen the GTA, GTB, GTC, GTD, GTE, GTI, GTO, GTR, and GTS nameplates on the back of a diverse selection of cars ranging from a Volkswagen to a Ferrari. 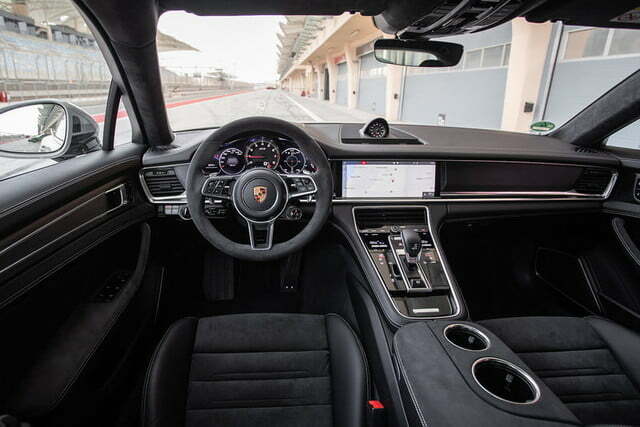 It’s the last acronym that Porsche claimed as its own to denote the members of its lineup positioned at the intersection of cosseting luxury and track-ready performance. 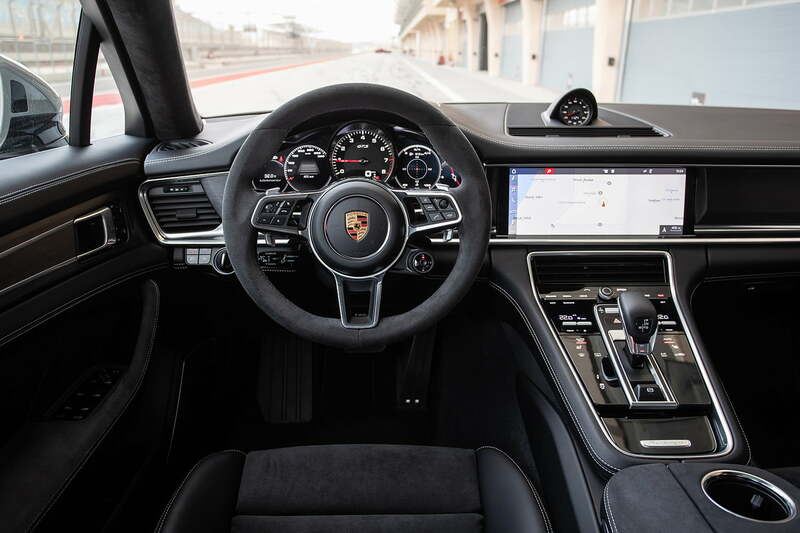 Digital Trends traveled to Bahrain to experience the 2019 Panamera GTS, the newest member of the clan. It picks up where the first-generation model left off with more tech – including a feature never before seen on a Panamera – and, controversially, a pair of turbos. Porsche offers the Panamera GTS as a sedan with a fastback-like roof line and as a station wagon called Sport Turismo. The standard Panamera starts at $128,300; the wagon costs $134,500. Neither figure includes a mandatory $1,050 destination charge or extra-cost options like Porsche’s InnoDrive technology. Even without add-ons, the GTS comes well-equipped with automatic LED headlights, rain-sensing windshield wipers, dual-zone automatic climate control, sport seats upholstered in a combination of leather and Alcantara, a crisp-sounding 10-speaker sound system, navigation, and a 12.3-inch touchscreen for the infotainment system, among other features. It’s not an affordable car by conventional means of measurement, but at least those who can fund its purchase will leave the dealership knowing they got what they paid for. The previous Panamera GTS – yes, that was the one with the hunchback-like roof line – was naturally-aspirated, meaning it didn’t have a turbo. Every single horse in its cavalry came from pure displacement; it was a glorious machine to drive. 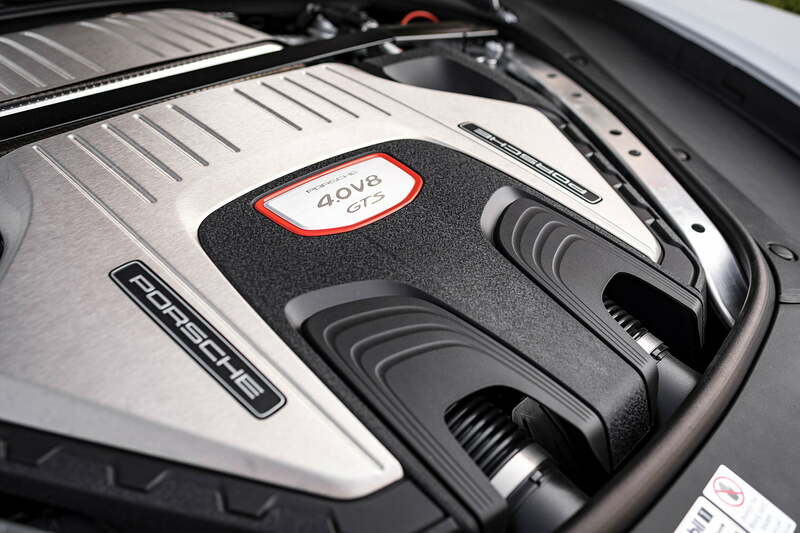 With the new model, Porsche argued there is a replacement for displacement and chose a 4.0-liter V8 twin-turbocharged to make 453 horsepower between 6,000 and 6,500 rpm and 457 pound-feet of torque from 1,800 to 4,500 rpm. The V8’s power goes to the four wheels through an eight-speed automatic transmission that the driver can leave to its own devices or shift manually using steering wheel-mounted paddles. 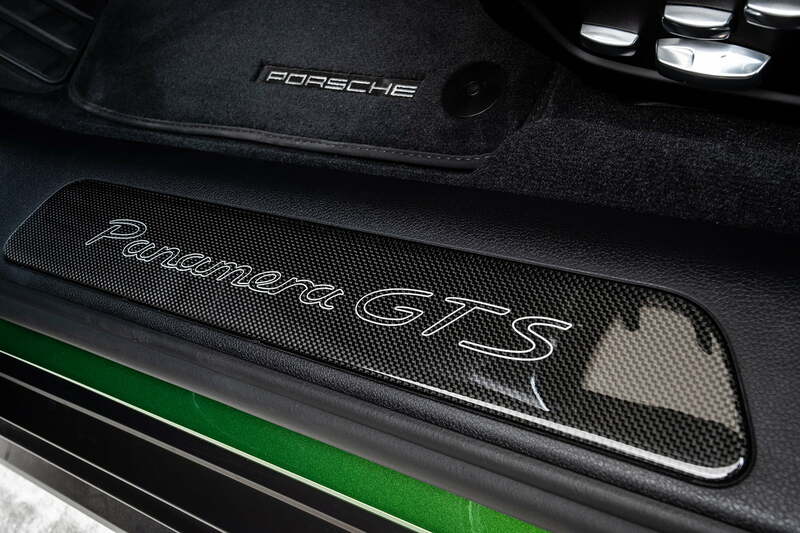 The engine in the last Panamera GTS sounded like Porsche’s answer to Pavarotti. The new model’s twin-turbocharged unit doesn’t provide the same kind of aural satisfaction but it’s smooth, punchy, and surprisingly linear. Though smaller, the 4.0-liter is more powerful than the 4.8-liter it replaces. What do those numbers mean in real life? Well, Porsche quotes a zero-to-60-mph time of 3.9 seconds – exactly on par with the 911 Carrera GTS – and a top speed of 181 mph. Numbers don’t tell the whole story, though, unless you’re playing Gran Turismo. The true appeal of a sports sedan isn’t its ability to upset the local sheriff but how it makes the driver feel mile after mile and turn after turn. 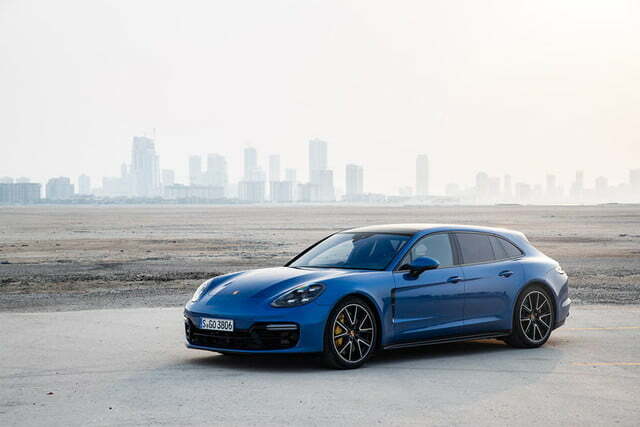 At about 4,400 pounds in its lightest configuration, the Panamera GTS enters the ring with a not-insignificant weight penalty but Porsche’s chassis wizards alchemized it into a car that feels much more compact than it is. The 2019 Panamera GTS picks up where the original left off with more tech and, controversially, a pair of turbos. We drove the sedan and the Sport Turismo models on the Bahrain International Circuit, a track the Formula One world invades annually. Both of our test cars came with the optional four-wheel steering system which turns the rear wheels in the opposite direction as the front ones at low speeds and turns them in the same direction at higher speeds. 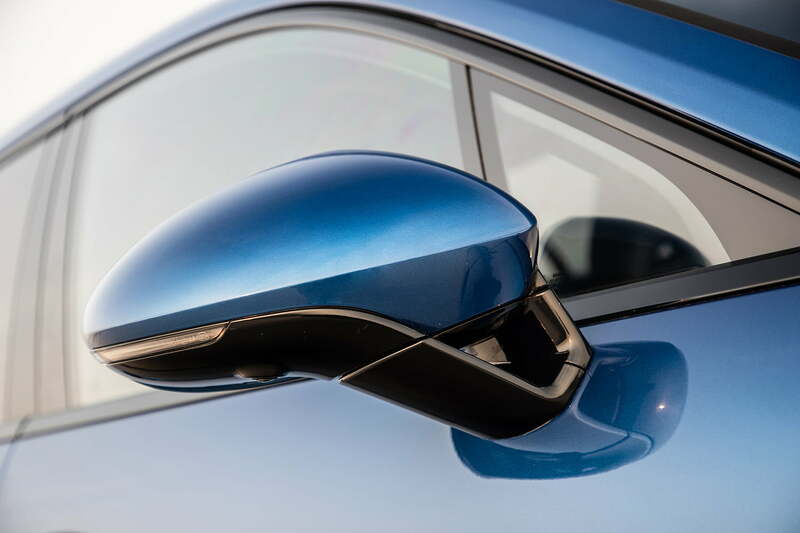 In everyday driving conditions, the system makes the Panamera easier to maneuver into tight spaces by noticeably reducing its turning radius. On a Formula One-grade track, however, it makes the sedan much more agile around sharp bends and more stable on the main straight, where the speedometer needle sometimes flirts with the 140-mph mark. We didn’t find a ton of on-center feel in the steering but it’s well-weighted and accurate. It’s not all in the steering; Porsche’s wizards cast other spells on the Panamera GTS to make it competent on and off the track. They gave it a level of grip we experienced turn after turn with near-superstitious awe. The carbon ceramic brakes stopped us like we’d just dropped a boat anchor out of the trunk, even when we asked for their help to slow down from triple-digit speeds. And, the air suspension (Porsche doesn’t offer a steel suspension on this model) nearly erases body roll when the sport plus driving mode is engaged. 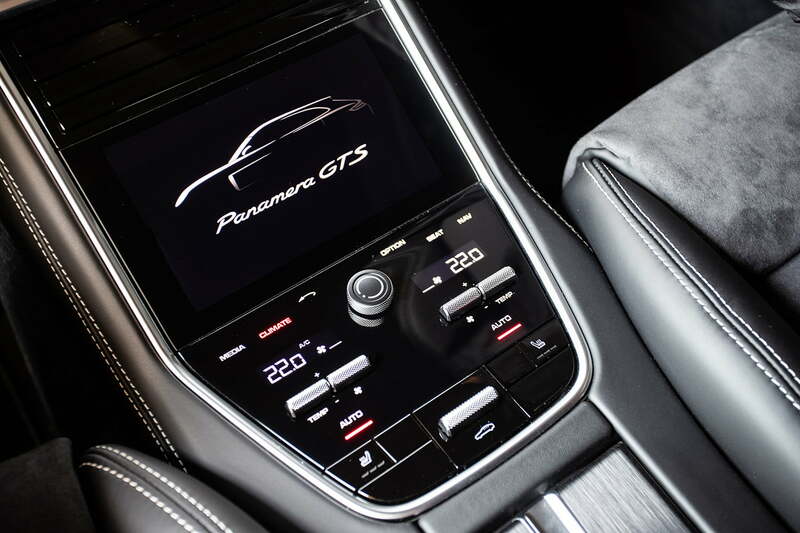 This comes at the expense of ride quality, of course, but selecting a driving mode called normal makes the GTS much softer and more compliant. It’s the one you’d choose when taking your mother-in-law for a ride. Us? Off the track, we found the mode plainly called sport delivers a well-balanced blend of performance and comfort, which is what GTS (Gran Turismo Sport, if you’re wondering) is all about. While the torque distribution is fully variable, the four-wheel drive system sends 75 percent of the engine’s power to the rear axle in its default configuration. 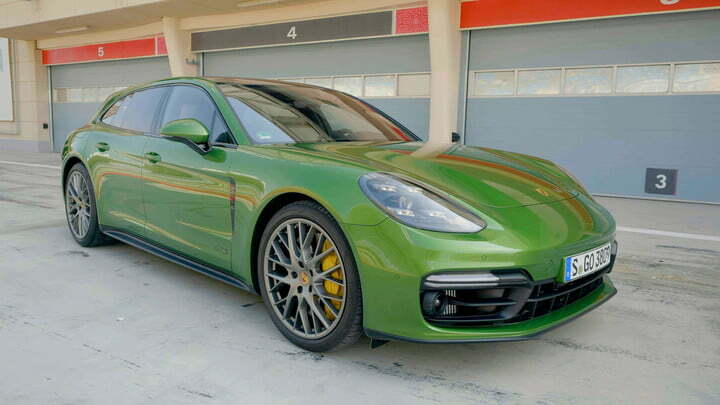 Porsche told Digital Trends it chose this split because it lets the Panamera offer enthusiast-friendly handling characteristics aligned with what you’d expect from a rear-wheel drive car without sacrificing traction when you need more of it, like on an icy road. We’ll have to take Porsche’s word for it; we couldn’t find an icy road in Bahrain. Our time on the island nation’s public roads was relatively short but it confirmed the GTS is as comfortable cruising at freeway speeds as other members of the Panamera line that we’ve tested in the past. The Panamera GTS isn’t a stripped-out track special with fabric door pulls and a roll cage – that’s not its calling in life. It’s luxurious and fluent in technology. Step inside to find a high-resolution, 12.3-inch screen for the infotainment system. It’s the same setup found in other variants of the Panamera as well as in the Cayenne. It’s an easy-to-use unit with quick response times and, for the most part, relatively shallow menus, especially considering the wealth of information programmed into the software. Apple CarPlay compatibility comes standard. Porsche continues to resist Android Auto, however. 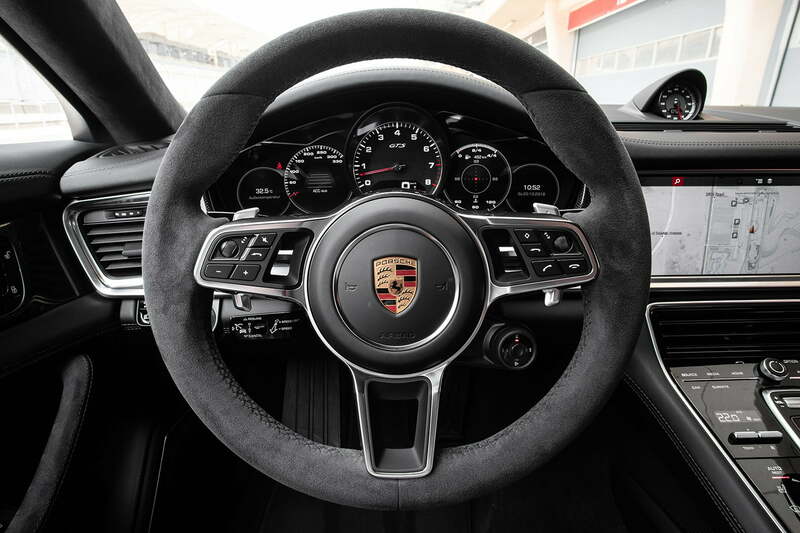 Porsche integrated two additional screens into the instrument cluster. They’re configurable using the buttons on the steering wheel. The long list of available display options includes a g-force meter, a gauge that shows the front-rear power split in real time, and navigation directions. 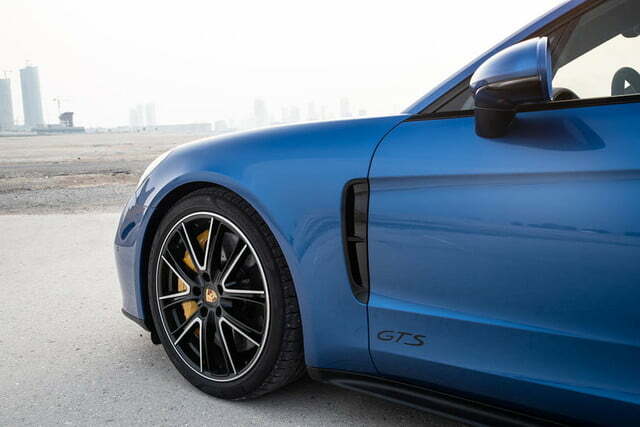 Porsche’s wizards gave the GTS a level of grip we experienced turn after turn with near-superstitious awe. 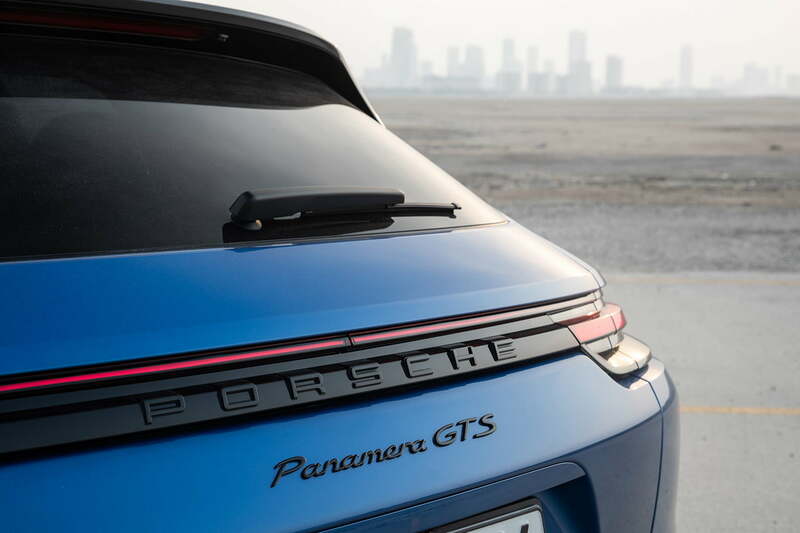 The GTS is the first Panamera equipped with a head-up display – hallelujah! This feature has been offered on many smaller, more affordable models for several years so it’s good to see Porsche finally get with the program. The head-up display shows information in a clear, legible manner legible even in bright sunlight. We loved having the option to customize it using a drag-and-drop menu in the touchscreen. We don’t need navigation directions on the track but the g-force meter was neat to look at mid-turn. While driving to and from the track, we didn’t have much use for the g-force meter (in Bahrain, many traffic offenses will send you straight to prison so it’s best to stay on the right side of the law) but navigation directions were extremely useful. Porsche told us its have-it-your-way head-up display technology will spread to other members of the Panamera lineup. The Panamera isn’t quite as large as other German luxury sedans, like the Audi A8 and the BMW 7 Series, but it’s big enough to earn the distinction of being a family car. It fills that role well, too. In its standard configuration, it offers space for four passengers and 17.4 cubic feet of trunk space. Folding down the rear seats yields 46 cubes – a genuinely usable figure. The Sport Turismo’s cargo capacity checks in at 18.3 cubes with a full load of passengers. Regardless of body style, the Panamera GTS comes standard with dual front, knee, side, and curtain airbags in addition to the mandatory traction and stability control systems. Porsche also includes an engine immobilizer and an alarm system with radar-based interior surveillance. Like every new Porsche, the Panamera boasts a four-year/50,000-mile warranty that covers a wide range of defects and a 12-year warranty against rust holes in the bodyshell. Mercedes-AMG created the athletic-looking (and unimaginatively-named) GT Four-Door Coupe with a clear mission in mind: to end the Porsche Panamera’s reign. The GT is relatively new so the lineup doesn’t include a variant honed in on the GTS yet but we imagine that will change sooner rather than later. In the meantime, the base GT 53 packs 429 hp from a hybrid-assisted powertrain built around a straight-six engine, while the two GT 63 models get a V8 rated at 577 and 530 hp, respectively. 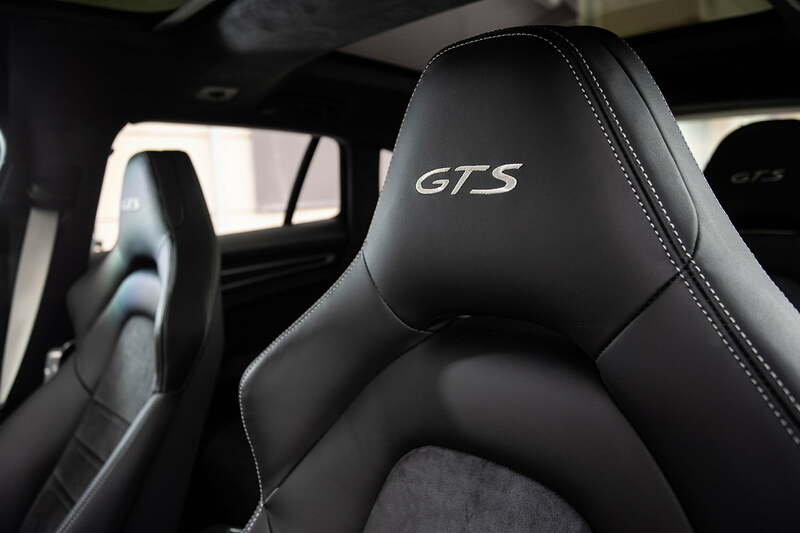 Buyers more concerned with speed than handling can cross-shop the Panamera GTS with a well-equipped GT 53, a model expected to start in the $100,000 range. 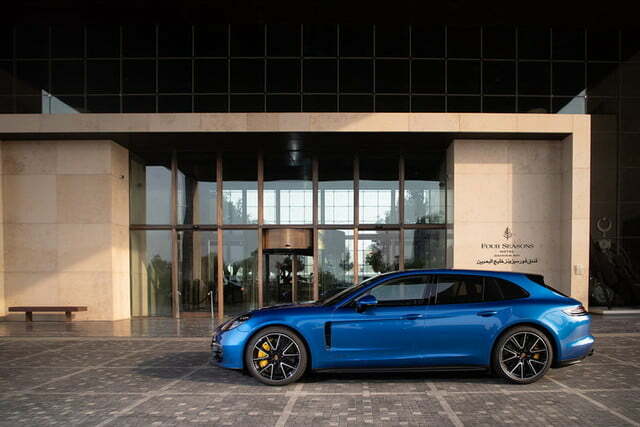 If we were shopping for a Panamera GTS, we’d start with the Sport Turismo model plainly because we think it’s one of the best-looking station wagons around. And, after driving both models back-to-back, we didn’t notice the slightest dynamic difference between them. We’d add the rear-axle steering system, adaptive cruise control, and the head-up display but we wouldn’t select the expensive carbon ceramic brakes that were fitted to our test car; they’re only necessary for serious (and regular) high-performance driving. All of the infotainment-related technology we could hope for is already included on the list of standard features so we wouldn’t need to tick additional boxes to reach a satisfactory level of equipment. On the road and on the track, we can safely call the Panamera GTS the best-driving four-door Porsche to date. It doesn’t have the charisma of its predecessor but it blends finesse and brute-like force in a way few other machines can. Mercedes-AMG still needs a mid-range GT model to truly give the GTS a run for its money. Whether it’s worth the nearly $30,000 premium over a Panamera 4S model depends on the kind of driving you plan on doing. Enthusiast motorists seeking a family car whose dynamism blurs the line between a sedan and a coupe won’t be disappointed, however.